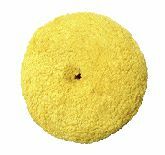 Cyclo Double Precision pads are double-sided foam buffing pads for the Cyclo polisher. Upgrade your Cyclo with the Cyclo DoublePrecision™ System! The 4 inch Cyclo DoublePrecision™ Foam Pads are made with Cyclo’s unique foam compositions plus the patented Quick Change System of The Edge. 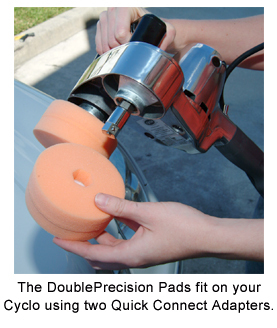 The 4 inch foam pads use the same self-centering Edge adapter to attach to your Cyclo Orbital Polisher! The Cyclo DoublePrecision 4 inch pads are versatile, reversible, and convenient! Now you can enjoy all the benefits of The Edge 2000 System on your Cyclo. Use two Cyclo Quick Connect Adapters (available at the bottom of this page) to screw into the Cyclo. (You will need to remove the two existing polishing heads.) Hand tighten the adapters, snap two Cyclo 4 inch pads into place(finish hand tighting)you’re ready to go! Vibration is virtually eliminated. The Edge 4 inch Cyclo DoublePrecision™ Foam Pads are balanced so well using the Edge Adapter; vibration is a thing of the past! The DoublePrecision Pads sit closer to the buffer housing than the regular Cyclo pads with no wobbly components between the pads and the polisher. The center adapter holds each pad perfectly level, regardless of the motion of the buffer. Using a Cyclo has never been so comfortable! Minimal risk of striking the paint. The Quick Change System eliminates the rubber boots, a.k.a pad holders, and the two orbiting heads. There’s nothing surrounding the pads so there’s nothing to impact the paint. For example, if you’re polishing a bumper and you accidentally graze the trunk with the side of the pad, it’s just foam. It won’t leave a scuff mark like a rubber boot could. Double-Sided. Because these pads use a center adapter, rather than a hook & loop backing plate, they have two usable sides of foam. You get twice the work area out of one pad compared to single-sided foam pads. The Quick Change System. The Quick Change Adapter is a solid-brass center post that screws into your buffer and allows you to snap pads off and on in seconds. This adapter makes the 4 inch DoublePrecision pads self-centering, meaning you’ll never have to deal with off-balance pads again. A tough plastic internal plate allows the DoublePrecision pads to keep their shape. Unlike conventional foam pads that become warped easily, The Cyclo 4 inch Edge Pads retain their shape thanks to a plastic plate in the center of the foam. This plate also holds the Quick Change Adapter in place and keeps the pad centered at all times. A full inch of foam on each side of the plate keeps it well protected against contact with the paint. Use the blue pad for general polishing and gloss-enhancement. The blue pad can be used with any finishing polish to bring out a fine luster on any finish. A dual head polisher deserves double-sided pads! 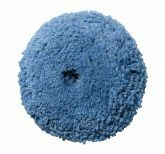 Outfit your Cyclo Polisher with the only double-sided foam pads on the market, The Cyclo 4 inch Double Precision Foam Pads. XMT Series by Pinnacle On Sale!